What is trim in the Astar? Coming from Bell products, love having a trim string again. Is trim accomplished with the string lined up straight with the center pillar, or is it offset and pointed towards the pilot? My lower back used to let me know if I was in trim or not, but I'm just generally sore and numb now so I'm having a hard time sensing it. The string lined up straight with the center pillar is your best option for the least amount of drag in forward flight. Your slip ball measures only the aircraft’s lateral balance resulting from the forces of gravity and centripetal force. You can observe this fact by holding your helicopter in a hover over a spot where the helicopter is neither moving laterally or vertically and noting the position of the ball. It will be off to one side of center. This is all due to the fact that the helicopter is an aerodynamic beast affected by both inertia forces and aerodynamic forces. The ball’s position is affected only by inertia forces (gravity and centripetal force, if any). You’ll have an offset lateral CG, offset from the vertical axis of the helicopter, due to any aerodynamic moment created by the tail rotor thrust, main rotor tilt, and or vertical stabilizer forces, which are the source of the “inherent sideslip” that all helicopters with a tail rotor experience when flown in ball-centered, straight and level flight. With the string lined up straight with the center pillar in forward flight, you may note that your slip ball is nearly in the same position it was in the hover described above when you were in a stationary hover and the helicopter was in equilibrium aerodynamically. Again, the string is your best option for the least amount of drag in forward flight with the aircraft in-line with the relative wind. 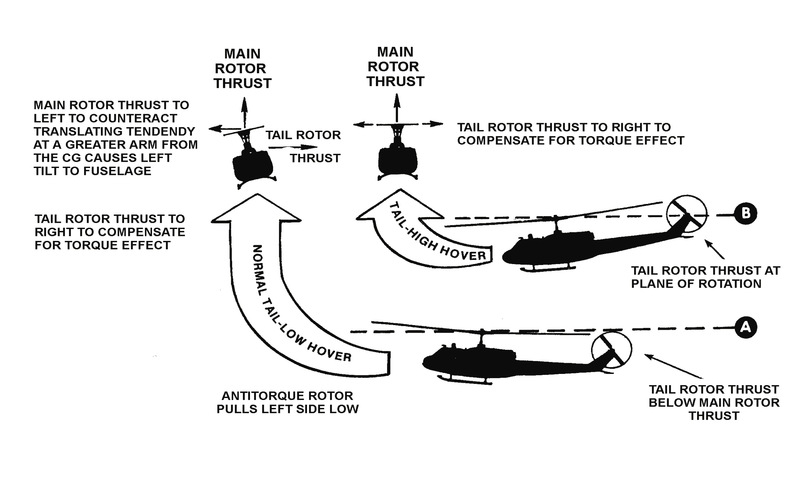 In any case, you may still have 1 to 2 degrees of “inherent sideslip” which is a characteristic attributed to most single rotor helicopters with a tail rotor. Fuselage left tilt as shown above, counter-clockwise turning main rotor. Fuselage right tilt on clockwise turning main rotor. As viewed from the top. Edited by iChris, 24 October 2018 - 21:49.